Last week the FBI raided Javed Iqbal’s Brooklyn storefront and his house in Staten Island, which was home to an FCC-licensed earth station (E040456). Iqbal was arrested for making available broadcasts from Al-Manar, a Hezbollah-controlled Arabic TV station based in Lebanon. Articles in the Washington Post and the New York Times cover the legal and political side of Javed Iqbal’s arrest but provide little information on Javed Iqbal’s HDTV Corp. satellite and uplink operation. 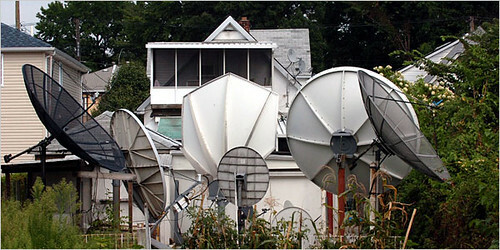 I was intrigued by the operation of an uplink that has attracted worldwide attention from its owner’s back yard! Using information available on the FCC Web site, Lyngsat.com, Iqbal’s own Web site www.hdtvuplink.com and satellite operators’ Web sites, I was able to gain more insight into the technical operations of HDTV Corp. According to its Web site, HDTV Corp.’s customers include several government agencies: FEMA, the FBI, the U.S. Department of State, NASA, the U.S. House of Representatives and others. Several large international companies, including Shell, Exxon Mobil, General Dynamics and Fluor are also listed as customers. Once you’ve browsed through the HDTV Corp. Web site take a look at the picture at the top of the article, "New York Man Charged With Enabling Hezbollah Television Broadcasts". Information on Iqbal’s uplink is available using the Quick Search feature on the FCC International Bureau’s IBFS Web page. The only license I could find using his company name — HDTV.LTD is what shows up in the FCC database — and his FRN 0011344298 was E040456, granted in January 2005. This authorizes a Ku-band uplink at 242 Van Ness Avenuein Staten Island, NY. The application for the license specifies "ALSAT" as the points of communication (these are all the U.S. licensed satellites, plus those on the FCC’s permitted list) and shows the antenna as a Radiation Systems 240AT 2.4-meter dish. Maximum input power is listed as 290 watts. Can you find that satellite dish in the photo? News reports indicated that Iqbal was arrested because he was supporting terrorist activities. At least one report notes that since the U.S. has determined Hezbollah is a terrorist organization, doing business with it is a clear violation of U.S. law. How did Iqbal bring Hezbollah programming into the U.S.? It is unlikely he paid Hezbollah for the programming. According to the premier source of satellite information, LyngSat.com, Al-Manar TV, the Hezbollah channel Iqbal was arrested for distributing, is available on at least three satellites, Arabsat 2B, Badr 3, and Nilesat 102 at no charge. My research showed none of these satellites have a footprint that reaches the U.S. However, www.hdtvuplink.com says HDTV Corp. has teleports in the Pakistan and the United Kingdom, where the Al-Manar satellites can be received. The LyngSat listing for the Amazonas satellite at 61 degrees WL shows HDTV Corp. as having a portion of transponder 1(V), at 11,972 MHz. The LyngSat listing for HDTV Teleport shows Iqbal’s company had access to Telstar 12, Hispasat 1C, as well as Amazonas. Any of these could be used to relay signals from Pakistan or the United Kingdom to the United States. Did Javed Iqbal simply provide a way for his customers in the United States to see Middle Eastern satellite broadcasts, or was he supporting or promoting terrorism through his relays? The Times article considers this. If the customer list is accurate, it appears that the U.S. government used his satellite services. It will be interesting to see how this case develops. An article in today’s New York Sun, titled "D.C. Lobbyist is Key in Stopping Hezbollah Broadcasts," indicates that a Coalition Against Terrorist Media lobbyist may have been responsible for shutting down a satellite service that the U.S. State Department may have been using. Could broadcasters be arrested for showing video from a terrorist organization? To follow this story, use this Google News search. While none of the articles have the technical detail I’ve provided here, they provide an interesting look at the legal issues in this case from several different perspectives, including possible First Amendment problems with the case. I’ve been accused of being a crazy cat lady from time to time, and I can live with that. And I have a penchant for tech toys and all things geek. So it figures that I would come across this new product while surfing. Measuring approximately 5 cms wide, 2.5 cms thick and 9.4 cms long, the PetsCell™ sets the standard for GPS tracking devices for pets. Unlike any other ‘Rush to Market’ products currently available. The PetsCell™ utilizes the new CDMA / GPS tracking technology, rather than the current GSM technology. This technology is so new, PetsMobility is the first company to be provisioned by network providers to use this technology in the (LBS) pet industry. I don’t know if I like this idea or not. I guess it can work but…calling my pet’s cell phone? Using GPS to track where my dog has been all day? An article in today’s issue of the Financial Times, says that flights on discount airline, RyanAir, are going to make use of mobile telephones available on their entire fleet of Boeing 737-800s over the next two years. AirFrance will launch the first trial of the same system, which uses technology developed by OnAir, in February, while RyanAir hopes to have obnoxious ringtones going off at 35,000 feet starting in July. BMI British Midlands and TAP Air Portugal will also be testing the OnAir system in Q2 2007. For those that are worried about the inevitable volume increase the addition of mobile phone service to airliners will cause, Ryan Air’s Chief Executive Michael O’Leary tells customers to expect nothing less from his airline. "If you want a quiet flight, use another airline. Ryanair is noisy, full and we are always trying to sell you something." Nonetheless, there is some hope that airlines without Ryanair’s brashness will limit the calling to some degree: According to the Financial Times piece, pilots can control the service and are likely to switch to "silent" mode on night flights, blocking calls but allowing text messages. I’m picturing a sky filled with flying robots. Believe me, I’m not being paranoid here. I know I keep going on and on and on about them, but they seem to be everywhere lately. Everyone’s using them for something, and building better versions of them every day. Remember that competition in Europe? Remember that European robotics contest back in May, that featured flying robots (a/k/a UAVs)? Turns out there was one that took place stateside back in July, in Fort Benning, GA: the International Aerial Robotics Competition. The winners were a team of students from the South Dakota School of Mines and Technology. And this after losing their primary remote-controlled helicopter. Luckily they waited a few hours after the final competition to crash their back-up device. Long days and sleepless nights paid off for a team of students at South Dakota School of Mines & Technology that finished first in the International Aerial Robotics Competition at Fort Benning, Ga., July 24-27. The team rebounded from the loss of its primary remote-controlled helicopter only to crash its backup helicopter within hours of the final round of competition. …After crashing the primary helicopter two weeks before the event, the team’s backup helicopter was wrecked during a practice flight when its engine failed the day before the flight competition. Tech learned at a banquet the night before the flight contest that it was leading with firsts in best paper, best presentation and best team T-shirt design. “That really renewed everybody’s strength,” Kjar said. The team worked all night to rebuild the helicopter. 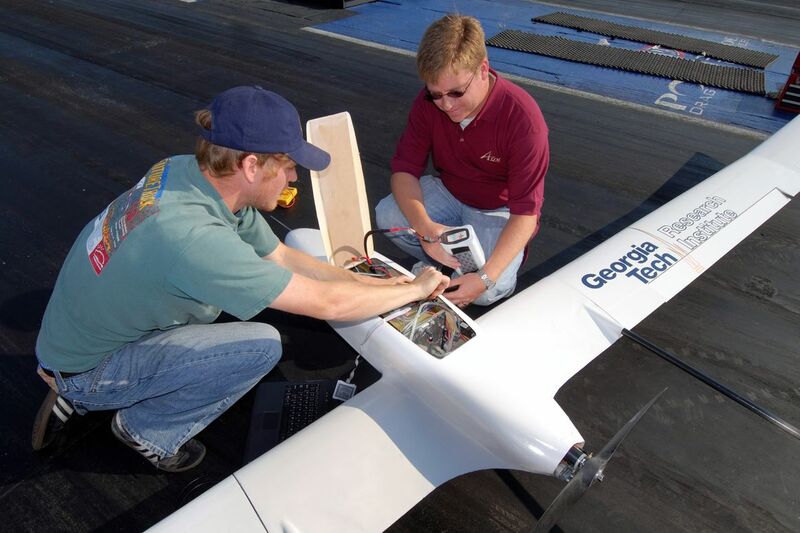 Tech and the University of Alabama had the only vehicles that successfully completed the flight course. The South Dakota team has website featuring photos and videos of their robots in flight. One of the South Dakota students quoted in the article above mentioned that this technology might have potential for military use. Um, yeah. Turns out the Army already has one — called the Shadow 200 TUAV — zipping around the skies above Alaska. There’s photos and videos of that one in action too. How’d They Get That Shot? 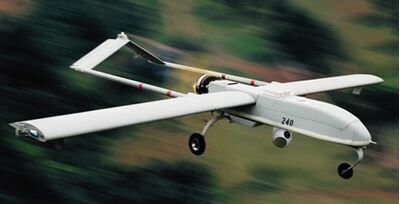 More UAV posting. Have you ever watched a movie or even a television commercial and asked "How’d they get that shot?" I know I have, and I usually find myself wondering just how they maneuvered a helicopter to get that shot. Until now I thought that maybe it was due some pilots with very steady hands. Now it turns out there aren’t any pilots at all. Companies like 1 Advanced Technologies employ UAVs (those flying robots that haunt my dreams) to get some of the best shots in film and television. But some of these shots would be impossible with a helicopter. (Where’s the wind?) That’s where this little thing comes in. I don’t know what it’s called, but it gets into some tight spots that no manned aerial vehicle could, to produce the kinds of visual shots that we pretty much take for granted. And I won’t even get into the maneuvers it makes possible. I’m not sure how it all happens, but the company has a video demo on its "Film Industry" page that shows this flying robot in action, making movie and commercial magic (OK, "commercial magic is probably a stretch) you might have seen before. This is one I couldn’t quite believe, especially after World Jump Day, but apparently the Finns have come up with a special day for every frustrated mobile phone user who’s ever wanted to toss the darn thing. Ever heard of the Mobile Phone Throwing World Championship? It was held in Finland this weekend. Old phones were supplied for contestants who were allowed to pick which kind of phone they wanted to throw. The men’s winner threw his phone 292 feet. The women’s winner tossed her phone 167 feet, a new world record according to the organizers. She said she has tossed a cell phone a time or two before. Apparently, it’s real. And there’s even video. I suppose it makes for a convenient excuse to upgrade your phone. I just hope all those tossed phones were properly recycled afterwards. Flying Robots & Free Fuel? I don’t mean to go on about those flying robots. You know, the ones with the tentacles? In Europe? Yeah, those. I don’t mean to go on about them, but they always seem to be in the news. This time they’re going by a different name: Stratellites. And they’re taking up a new function: wi-fi. Bob Jones has a lofty idea for improving communications around the world: Strategically float robotic airships above Earth as an alternative to unsightly telecom towers on the ground and expensive satellites in space. Jones, a former NASA manager, envisions a fleet of unmanned “Stratellites” hovering in the atmosphere and blanketing large swaths of territory with wireless access for high-speed data and voice communications. …Jones believes his solar-powered, helium-filled Stratellites _ so named because they would hang in the stratosphere — could replace unsightly cell towers and cost less than satellites. Because of the airship’s altitude according to Jones, its radio equipment can cover an area the size of Texas. Cell towers are hampered by line-of-sight limitations and limited range. Geostationary satellites suffer from the quarter-second it takes a signal to travel out 22,300 miles and back — insignificant in one-way TV transmissions, but terrible for two-way Internet computer communications. The idea bubbled up and popped around the same time as the dot.com bust, yet it may be an idea whose time has come again. If so, Jones might want to consider some alternative fuels for getting his stratellites aloft. For example, he might look into fuel cells. These guys at the Georgia Institute of Technology got their flying robot aloft using a hydrogen fuel cell. And if hydrogen is cost prohibitive, Boing Boing says this company has build a machine that generates free energy. Then again, if the comments and tags on that Google video are right, maybe not. Hurricane Katrina was the costliest storm in American history, which occurred during what became one of the nation’s busiest hurricane seasons. The category 5 hurricane hit the Gulf of Mexico’s northern coastlilne on 29 August 2005, including the city of Biloxi, Miss. Sustained winds of approximately 150 miles per hour, accompanied by its rain and storm surge, caused catastrophic flooding in Biloxi – dozens of feet above and further inland than normal – destroying important terrestrial infrastructures vital for adequate shelter, economic sustainability and civic functions. Homes, office buildings, telephone poles, hospitals, television and cell phone antennas, government headquarters and places of worship, were completely flattened. Since most of the area’s terrestrial-based forms of communication had been destroyed and were near useless, a satellite-based WiMAX (Worldwide Interoperability for Microwave Access) WAN (Wide Area Network) communication network for the city of Biloxi was a viable option. WiMAX is a wireless communications technology that provides high-throughput broadband connections for considerably longer distances than that offered via a WiFi (Wireless Fidelity) LAN (Local Area Network) network. Motivated to immediately help in relief efforts after the hurricane dissipated, Craig McCaw, who through his investment company Eagle River, has an ownership in Clearwire, offered the Clearwire WiMAX service to government leaders in Mississippi in order to provide the needed communications after the hurricane. Clearwire is a high-speed, wireless broadband Internet service provider. SES AMERICOM was then contacted to join in his quest to help reestablish Biloxi’s communication network. 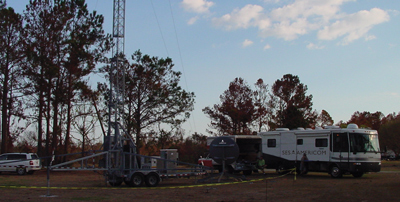 SES AMERICOM employees were dispatched to Biloxi, and immediately installed and connected two-way satellite ground stations called VSATs (Very Small Aperture Terminals) to Clearwire’s WiMAX towers. Relief agencies, hospitals, fire, police as well as businesses and residences within the established WiMAX network were able to get reliable, 24×7 voice and data connectivity to the outside world via this hybrid satellite/WiMAX network. It’s experiences like these that prompted the Satellite Industry Association to publish a "First Reponder’s Guide to Satellite Communications" earlier this summer. A year later, businesses in the area are still squabbling over what resources get restored first. Earlier this month I was somewhat obsessively following the story of China’s space program and U.S. concerns about a looming "Sputnik moment" with China. Well, it looks like using "Sputnik" and China in the same breath may be appropriate as China teams up with Russia for a mission to Mars. China and Russia are planning a joint mission to Mars that will not only bring samples back to earth but also land on one of the red planet’s tiny moons, a Chinese space scientist here has said. Ye Peijian, a leading scientist with the Chinese Research Institute of Space Technology, made the announcement at an ongoing forum on China’s space technology development. Ye said Russia will launch the spacecraft in 2009 and it will carry China-made survey equipment. It will collect samples on Mars and the planet’s nearest moon. Sun Laiyan, administrator of the China National Space Administration said last month at an international space conference that China is actively planning its deep space exploration over the next five years, focusing on lunar and Mars exploration. "We will encourage other countries to take part in space science programs initiated by China, and Chinese scientists will participate in international space science programs," Sun said. The lunar mission definitely jibes with previous reports of China’s space-related ambitions. And the invitation for other countries to take part might bode well for similar U.S. ambitions, in light of China’s earlier invitation to a NASA official to visit the country next month, and check out their space program. But it sounds like the Russians are already on board. So does this qualify as a "Sputnik Moment" yet? I gotta admit, there are times when I’m just not feeling the DIY vibe. One of them is when I have a satellite dish that needs installing. The last couple of times I’ve moved, I’ve had someone some an install the dish for me, but apparently there are some folks out there who just want to do it themselves. And I salute them. After all, better them than me. They may just be better at it than I am. Or more creative. I’m just a "bolt-it-to-the-side-of-the-house-and-call-it-a-day" kind of guy. Who knew there’s a better way to do it? Well, some people do. For example, can you spot the dish in this picture? 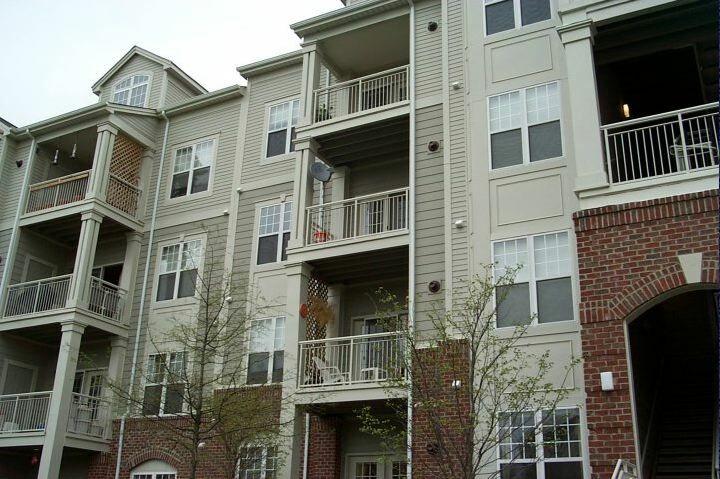 The author goes into some detail on just how an apartment dweller can achieve an aesthetically pleasing satellite installation. So as we all know, to use satellite TV, I needed to install a dish. I elected for the Dish500 dish, which is slightly larger than your normal 18-inch DBS dish, but it can also lock on to 2 satellites at once, giving me a wider channel range. The real difficulty was going to be where to install the dish, and would the apartment complex let me. The second problem was solved by the FCC last year. They issued a resolution that says that no one, not an HOA, locality, or my landlord, can prevent me from installing a dish of less than 36 inches in diameter somewhere that I have exclusive access to (like my balcony). However, in the interest of keeping up good relations, I told my landlord before I started the install. They wanted me to sign a lease addendum, which I did because it didn’t have any significant language in it. Having done that, I proceeded to the question of how to install the dish securely on the balcony. I elected to go with the concrete bucket install described by a couple people on some of the DBS message boards. Basically, I mounted a piece of metal conduit in a bucket full of concrete, mounted the dish on top of the conduit, and bungeed the whole assembly to the rails of my balcony. It provides a very stable installation. I haven’t had any problems with the dish so far, and we’ve gotten some really high winds for the area since I got it set up. It actually looks like quite an effective setup, and easier than drilling holes in an external wall. There’s some pretty good advice for householders too, such as painting it the same color(s) as your house, in order to camouflage it. Me? I’ll stick to calling the guys with the tools, to come bolt it to the wall. Unless someone else has another idea.